Subtitled “Tankas and Haiku” is Shouting Your Name Down The Well, Toronto writer David W. McFadden’s first trade poetry title since he won the 2013 Griffin Poetry Prize for What’s the Score? (Mansfield Press, 2012). The prolific author of dozens of poetry collections (as well as novels and travel books) going back six decades, McFadden’s poetry has long been known for its odd humour, witty observations and deep intimacy, managing to create literary works that allow the smallest moment to enter into the reader’s consciousness and remain there for some time. McFadden’s poetry has also managed to exist in the difficult terrain of being entirely readable (what the non-reading public often refer to as “accessible”) while exploring complex and even difficult observations, subtleties and hidden quirks. Somewhere during the 1990s, McFadden shifted from the larger, longer poems he had been working on, such as the sonnet-collection Gypsy Guitar (Talonbooks, 1987), for smaller works, culminating in the chapbook Last Chance to Hit Balls (Six Tanka and Six Haiku) (above/ground press, 2006), his first under a name he was using as part of his exploration of Japanese forms of poetry: Genmai. One form didn’t necessarily replace the other, and he still produced lengthy collections of sonnets, even as he began to expand his repertoire of poetic forms. 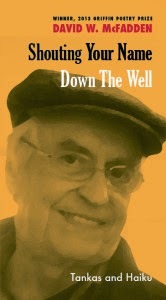 In Shouting Your Name Down The Well, McFadden (aka Genmai) composes an accumulation of short poems as koans, and writes on subjects that are familiar to even the most casual reader of his work, from the day-to-day of his downtown Toronto, to classic films such as Breakfast at Tiffany’s, to the writings of Issa, bpNichol, Roshi, Victor Coleman and George Bowering, to mescal, the late painter Greg Curnoe, and to other geographies including London, Ontario and Lake Ontario. There is something in the way McFadden returns to certain subjects, writers and geographies that extend, as opposed to repeat, the already expansive territories of his published work. The back cover of the collection estimates the number of poems within as “500 or so poems,” and I’m willing to believe them (as opposed to doing a count). This is a rich and rewarding collection of observations, quiet meditations and roaming conversations in which one can so easily get lost, pouring through poem after poem in any order. Purchase Shouting Your Name Down the Well HERE.